Pongal is upon us, again! Time to worship the Sun God, clean the full house, decorate the walls and floors with rangoli and what not? But do you know why we celebrate Pongal? If not, read on to know about the fascinating history of Pongal. If you wish to send it to anyone of your choice you can certainly do so. Just click here. Wish you a happy Pongal from all of us here at TheHolidaySpot. This three-day Hindu harvest festival falls in the month of Magha, corresponding with the solar equinox. 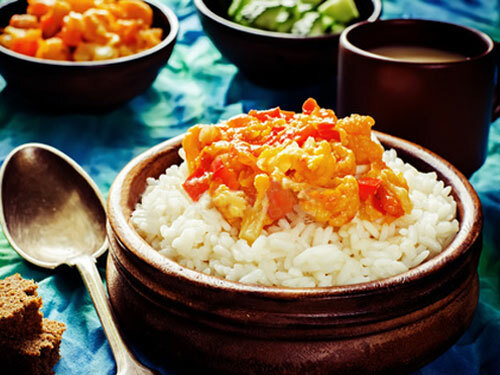 Celebrated in the south, it is marked by the cooking of the rice from the first harvest after the long and arduous winter. This three-day harvest festival is celebrated every year in Magha, from the 13th to the 15th of January. The word 'pongal' refers to the dish of sweet rice prepared on this occasion. The festival is celebrated widely in Tamil Nadu, Andhra Pradesh and Karnataka. The time of the festival is of great importance to all Hindus, as it corresponds to the solar equinox when the days begin to lengthen and the nights begin to wane. According to Hindu mythology, this is when the day of the gods begins, after a six-month long night. The festival is spread over three days and is the most important and most fervently-celebrated harvest festival of South India. A special puja is performed on the first day of Pongal before the cutting of the paddy. Farmers worship the sun and the earth by anointing their ploughs and sickles with sandal wood paste. It is with these consecrated tools that the newly-harvested rice is cut. The first day is called Pongal Podigai or Bhogi Pongal and is a day of family feasting and enjoyment. Since the festival celebrates the harvest of the paddy crop, the newly harvested rice is first cooked on this day. The rice grains, along with sesame seeds, jaggery, chick peas, groundnuts and dried coconut, are put into an earthen pot filled with milk. This is boiled until some of the milk spills over, and the preparation is called 'Pongal'. It is generally cooked at an auspicious hour, recommended by the priest, in the court yard of the house. A portion of the cooked rice is	offered to Ganesha, and the rest is shared by the family, neighbours and friends as consecrated food. As people greet each other, they ask paal pongita or 'has the milk boiled over?'. Another ritual observed on this day is called Bhogi Mantalu, when useless household articles are thrown into a fire made of wood and cowdung cakes. Girls dance around the bon ire, singing songs in praise of the gods, the spring and the harvest. In Andhra Pradesh, in the morning the girls burn their old clothes and wear new ones after an oil massage and bath. Then follows Pongal Panai, a ritual in which the newear then ware pots are painted and decorated with turmeric, flowers and mango leaves. The second day is known as Surya Pongal, the day for the worship of Pongal. The pongal is allowed to boil over Surya, and the rice cooked in milk and jaggery is offered him. When the foodis being cooked and when it boils over, people shout pongalo pongal loudly and many times to rejoice. On this festive day, a newly-married couple, symbolising freshness and joy, is presented with new clothes by the bride's parents. The servants of the house are also given new clothes to wear. Bathing in the sacred rivers during Pongal is believed to be extremely beneficial. Hence, devotees flock to Tanjavur in Tamil Nadu to bathe in the waters of the Kaveri, and to Tirunelveli, also in Tamil Nadu to bathe in the river Tamrapani. Bathing in the sea at Vedanaranyam in TamilNadu is also considered auspicious. The third day is known as Mattu Pongal or Gopuja, the day of Pongal Shiva cursed Basava to live on earth forever for cows. It is marked by cattle worship. In earlier times, cattle formed the chief asset of an agriculturalist and it was only proper that their services were recognised and celebrated on this day. The cattle are given a ceremonial bathin the morning, their horns are cleaned, polished and painted, and then decorated with flowers. They are then given Pongal to eat. Arati is performed on them, so as to ward off the evil eye. According to a legend, once Shiva asked his bull, Basava, to go to the earth and ask the mortals to have anoil massage and bath every day and to eat once a month. Inadvertently, Basava announced that everyone should eat daily and have an oil bath once a month. This mistake enraged Shiva who then cursed Basava,banishing him to live on the earth forever. He would have to plough the fields and help people produce more food. Thus the association of this day with cattle. A festival called Jalli kathu is held in Madurai, Tiruchirapalli and Tanjavur,all in Tamil Nadu, on this day. Bundlesof money are tied to the horns of Pongal ferocious bulls which the villagers try to retrieve. Everyone joins in the community meal, at which the food is made of the freshly harvested grain. This day is named and celebrated asTamilian Tirunal in a fitting manner through out Tamil Nadu. Muttu Pongal, also called Kanu Pongal, is also celebrated by sisters for the welfare of their brothers. This festival is reminiscent of Raksha Bandhan and Bhai Duja (see Diwali) of north India. A large banana (Musaparadisiaca) leaf is washed. It is then placed on the ground, next to the basil altar in the court yard. On it is placed a branch of the amla (Phylalnthusembelica) tree. On this leaf are placed at four corners, the left overs of sweet pongal and the salty pongal called Vand Pongal, ordinary rice as well as colored red and yellow, five betel leaves, two betel nuts, two pieces of sugarcane, turmeric leaves, and two or three bar (Ziziphus mauritiana) fruit. On this also reposes an oil lamp. In Tamil Nadu women perform this ritual before bathing in the morning. In Karnataka and Andhra Pradesh, the festival starts after everyone has bathed. All the women, young and old, of the house assemble in the courtyard. The eldest married woman distributes a handful of rice to all the others. The rice is placed in the centre of the banana leaf, while the women ask that the house and family of their brothers should prosper. Arati is performed for the brothers with tumeric water, limestone and rice, and this water is sprinkled on the rangoli in front of the house. Sisters apply a tilakon the fore heads of their brothers, and give them fruit, sweets, sesame seed and jaggery. The brothers thank their sisters for their good wishes and give them money and gifts. The celebration of this festival probably originated very early on. From the very beginning, the first agriculturalists realised the importance of a good crop, which sustained the entire clan. And since, to him, it depended on some super natural element, he thought it fit to thank the gods after a good harvest. Further, it was believed that all that is new, a new crop, the first catch of a season, and the first born of a domestic animal, was sacred and hence not to be touched by man until certain sacramental ceremonies were performed. A part of the new was sacrificed to the gods or spirits, and one's ancestors, and only	Pongal then could it be consumed. In addition, it was realised that the fruit of the earth and animals for food should not begarnered until they were ready. This was emphasised by the community; and until a ritual was performed, nothing could be gathered, slain, or eaten. The harvest festival of Pongal symbolises the veneration of the first fruit. The crop is harvested only after a certain time of the year, and cutting the crop before that time is strictly prohibited. Even though Pongal was originally a festival for the farming community, today it is celebrated by all. In the south, all three days of Pongal are considered important. However, those south Indians who have settled in the north usually celebrate only the secondday. Coinciding with Makara Sankranti and Lohri of the north, it is also called Pongal Sankranti. Though traditionally 'pongal' is cooked using the newly Pongal harvested grain, nowadays it is not easily available. Therefore families not directly involved in agriculture cook 'pongal' using old rice, to give thanks in the traditional way.